On October 1, the stage at the University of Johannesburg’s Con Cowan Theatre played host to a phenomenal showcase of performing arts talent. And, by the end of the show, four university students walked away with R170,000 worth of Scholarships to continue their tertiary studies. 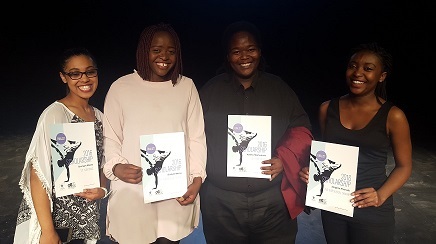 This Johannesburg leg of the Arts & Culture Trust (ACT) Scholarships Programme saw first year dancer Bronwyn Adams (Western Cape) and first year musical theatre student Sindisile Nkuna (Mpumalanga) each take home R50,000 worth of Scholarship funding, while second year singer Katleho Mokhoabane (Free State) and second year musical theatre student Songezo Khumalo (KwaZulu-Natal) won R35,000 respectively. Tasked with selecting the winners were Moving into Dance’s CEO, Nadia Virasamy; theatre director and designer, Jade Bowers; and actress, Nicole Murugan – no easy feat, as the calibre of this year’s finalists was truly top notch. Funded by the National Lotteries Commission (NLC), this year R320,000 is allocated to budding performing artists in their first and second year of tertiary studies from around the country. Thabang Mampane, Commissioner of the NLC, says they are honoured to assist these young artists reach their full potential. “Grants of this nature are in line with Governments commitment to provide opportunities for the youth of South Africa,” she says. Since 2009, ACT has been supporting arts students through their Scholarship Programme. But 2016 is an exciting year for the Programme as there are more Scholarships on offer than ever before. The Cape Town showcase, which took place last month saw four more university students clinch prize money to further their studies. And, on October 10, six triple threat matric students will sing, dance and act before an audience and a panel of judges in hopes of laying claim to a Scholarship that will entitle to them to begin their performing arts studies at an accredited South African tertiary institution of their choice.